Guaranteed Winnings? Is that really true? It certainly is. The Guaranteed Winnings promotion at VeraJohn Casino has been active since the middle of May and during the first 6 weeks, 7 lucky winners walked away with guaranteed cash. In July and August, when they added a special twist to the promotion they had 22 lucky guaranteed winners and in September when they first introduced the double cash days they had a total of 11 cash top ups. In October, another 11 lucky winners received a top-up bonus thanks to the Guaranteed Winnings promotion. You can see the winners' list at VeraJohn Casino's website. These guaranteed cash wins have been paid on top of what their lucky winners have already won at the casino. Since the launch, on May 20th, VeraJohn Casino has paid a total of €158,623 in Guaranteed Winnings. The October Guaranteed Winnings promotion saw 11 ecstatic VeraJohn Casino players topped up with cold hard cash! There is no point in stopping the Guaranteed Winnings fun there, so they’ve decided to continue the cash top up craze into November. That’s right, another 30 days to become a Guaranteed Winner! Double cash days will continue too, so make sure you’re playing on the 12th, 20th, 25th and 29th of November for your chance to win €10,000. Let’s not forget that whopping €50,000 top-up that one lucky VeraJohn Casino player will win at the end of November. How it works is very simple. VeraJohn Casino guarantees that one player will win €5,000 after a real-money wager, while playing any of their thrilling web or mobile games. If there isn’t a single win of €5,000 each day, VeraJohn Casino will top up the highest casino win of the day, so that the winner walks away with a guaranteed total of €5,000. That’s cold, hard cash! Remember, they are still giving out a massive €50,000 prize at the end of the month. If there isn’t a single win of €50,000 by the end of the month, VeraJohn Casino will reward the highest casino win of the month, by topping it up to a grand total of €50,000. What are you waiting for, it’s that easy! Just play to become a VeraJohn Casino winner today! Here is how to get your hands on the 10 Free Spins at Gonzo's Quest at VeraJohn Casino. First you must register an account and it is important that you use the links here as it is an exclusive free spins promotion. 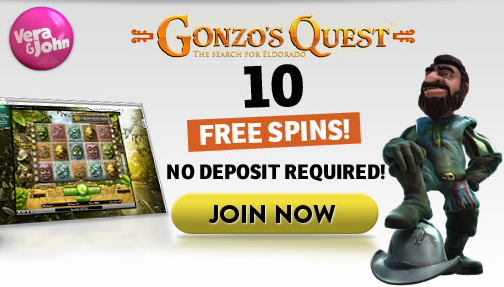 After registration you should start the video slot Gonzo's Quest to get your 10 Free Spins. This is a No Deposit Bonus, so no deposit is required as your free spins are automatically added to your account (but remember ONLY IF you used the links in this post!). And if you enjoy the free spins, don't forget that if you make a deposit then VeraJohn Casino will double it automatically up to €500. That's €500 Free on your first deposit. Imagine how many hours of play on all the slots that will buy you, and you will get millions of spins where you have the change to become a millionaire! Check out our casino bonus forums for more casino bonus updates! You are just one click away from 10 free spins on Gonzo's Quest and a 100% welcome bonus up to €500! Win a trip to Hollywood with PAF Casino!